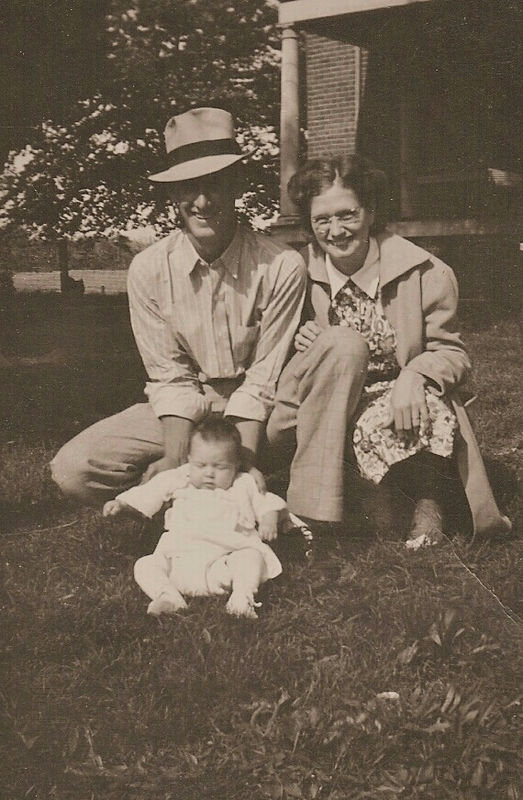 Just before he died on Feb. 5, 1941, my great, great-grandfather, George Boles, looked at my grandmother, Vada Frost Boles, and said, "I killed your uncle." What was he talking about? Who did he kill? 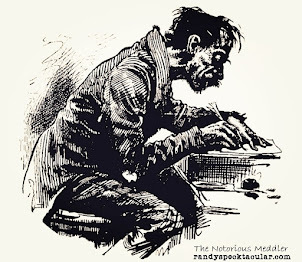 Because of Abraham Lincoln's stance against slavery, South Carolina, Georgia, Florida, Alabama, Mississippi, Louisiana and Texas seceded from the Union between December 1860 and February 1861. 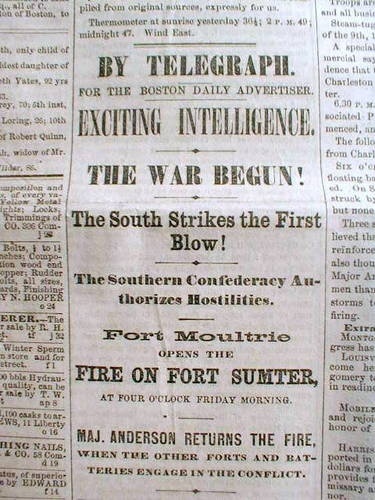 After South Carolina’s April 1861 attack on Fort Sumter and President Lincoln’s Call to Arms to put down the rebellion, four more states - Arkansas, North Carolina, Tennessee and Virginia - also seceded. The Civil War was on. But, while Tennessee voted for succession, most of the counties in the Upper Cumberland area voted against it. The Fentress County vote was 128 for and 651 against, however, the vote in neighboring Overton County, which included the area that is now Pickett County, was 1,471 for and 364 against. 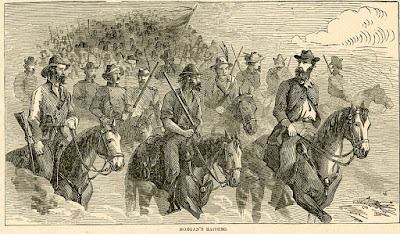 While a succession vote never took place in Kentucky, 100,000 Kentuckians served in the Union Army and between 25,000 and 40,000 answered the call for the Confederacy. Many communities and families were torn on the slavery issue. My grandmother Vada's Frost family is one example. It was literally brother against brother in her great-uncle Fletcher's family. Fletcher was the older brother of Vada's grandfather, Cord Frost. Fletcher and Cord married the Owens sisters, Cyrena and Almira. 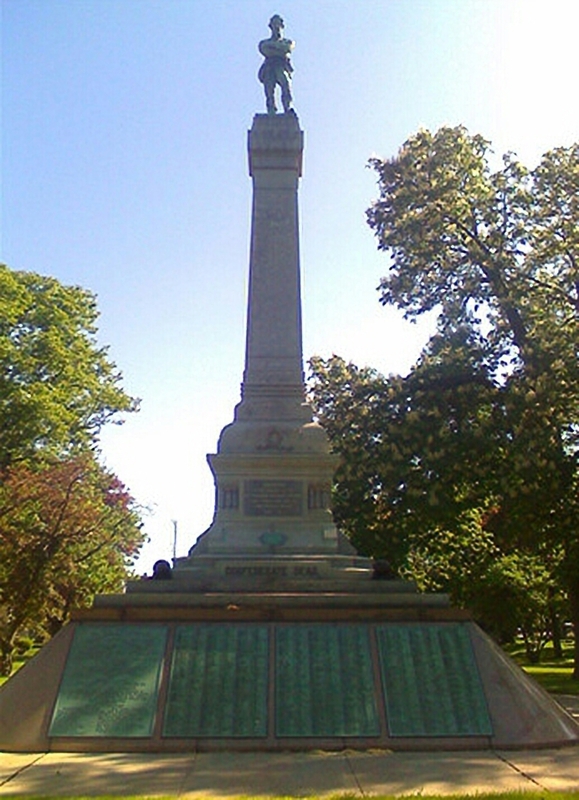 Three of Fletcher and Cyrena's sons fought in the war. Alexander served in the Union army, but two of his brothers joined the Confederacy. The 11th KY Cavalry of Kentucky Volunteers, B.W. Duke's Brigade, was organized on Aug. 10, 1862 and mustered into Confederate service on Sept. 10th for three years. Fountain Frost was a member of this Company K from its beginning. He was elected 1st Lieutenant on Sept. 1, 1862 and commissioned 2nd Lieutenant on March 10, 1863. He also rode with notorious guerilla Champ Ferguson. 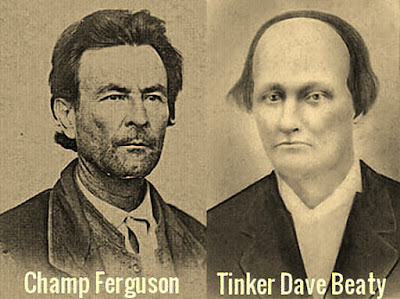 At Ferguson's trial after the war, he was specifically mentioned as being with him in March and October of 1862. Alvin Piles testified he saw Ferguson in the fall of 1862 driving out cattle, horses and mules on the South Fork in Wayne County. Over twenty men were with him, including Fount Frost. Two days before he was hung on Oct. 20, 1865, part of Champ Ferguson's confession to a Nashville Dispatch reporter included this..."I killed Joseph Stover after he had shot at me twice. He was taking a third aim when I shot him in the mouth, and Fount Frost shot him in the side at the same time." This happened in April of 1862. In September of 1863, a skirmish between Ferguson's company and Tinker Dave Beaty's Independent Scouts took place at Gilreath's Mill off present day Highway 325 in Fentress County. Fountain Frost was killed by Beaty's men. He was buried in an unmarked grave in what is now called Red Hill Methodist Cemetary next to mill. 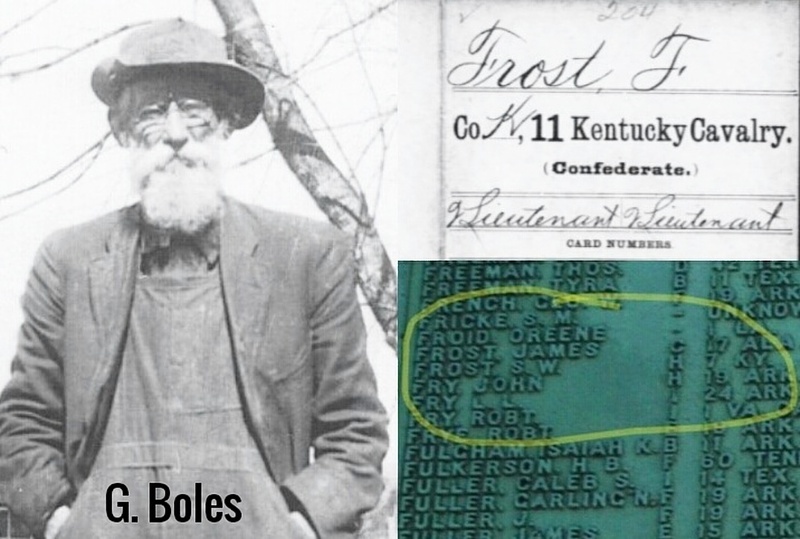 Did George Boles kill Fount Frost? It's not conclusive, but Fount is probably who George was talking about when on his death bed he told Vada Boles that he had killed one of her relatives. The actual account says Fount was killed by Beaty's men. George Boles was a member of Tinker Dave Beaty's Independent Scouts. His mother, Matilda, was Tinker Dave's sister. Fount Frost wasn't my grandmother's uncle, as he stated on his death bed. He was her second cousin, the son of her great uncle. Still, it makes sense that George was talking about Fount Frost. Fount Frost's brother, Samuel, was with Co. H 7th KY Cavalry during the Civil War and saw his life come to a tragic end following his capture during Morgan's Raid, a highly publicized incursion that purposely coincided with the Vicksburg and Gettysburg campains, meant to draw tens of thousands of U.S. troops away from those events. The raid headed north from Sparta, TN on June 11, 1863. Brig. Gen. John Hunt Morgan and 2,460 handpicked Rebels routed local militia at the Battle of Corydon in Indiana and headed east across southern Ohio. It was there that Union Maj. Gen. Ambrose Burnside ordered out all available troops and a battle at Buffington Island in Meigs County, Ohio on July 19, 1863 ended in the capture of over half of the 1,700-man Confederate force. 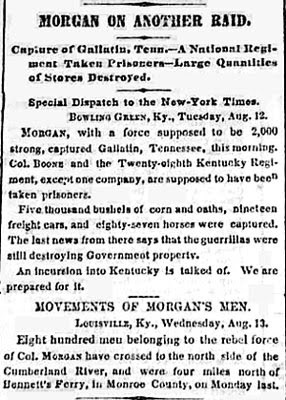 General Morgan and some 700 men escaped, only to surrender a week later, on July 26th, at the Battle of Salineville at New Lisbon. Samuel Frost was sent to Camp Douglas Prison in Chicago. He died there eight months later on March 26, 1864. 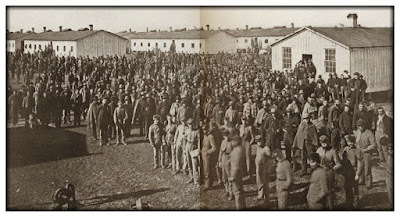 The official cause of death was listed as 'general debility,' a broad term referring to a loss of strength in the body, which in his case was no doubt highly degenerative considering the conditions at the camp. 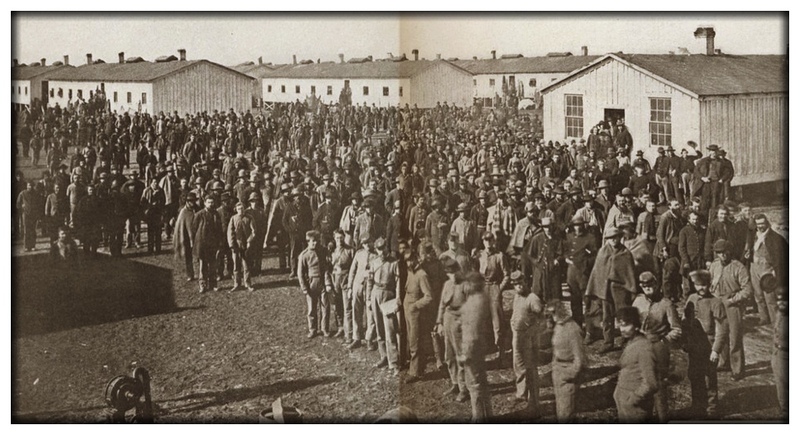 The official death toll at Camp Douglas was 4,454, but it has been estimated that more than 6,000 Confederate prisoners died there during the Civil War, not from battle wounds, but from diseases like smallpox, dysentery and pneumonia, plus starvation and torture. 4,275 known Confederates, including Samuel Frost, are buried in the Confederate Mound at Oak Woods Cemetery in Chicago, one of the largest mass graves in North America. 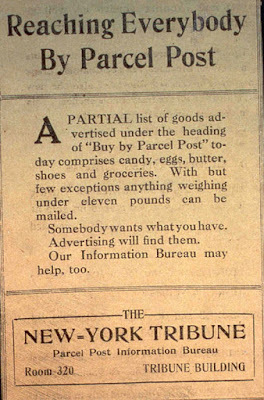 There could be as many as 1,500 more who were reported as unaccounted for. Fount and Samuel's brother, Alexander, who served in the Union Army, didn't die in the Civil War. He married Lizzie Rains on Sept. 23, 1888 in Carroll County, Arkansas. Alexander died around 1899. 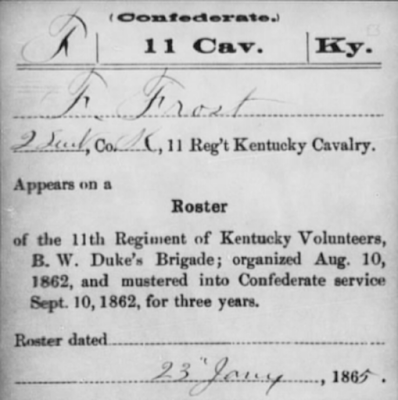 Their uncle, Cord Frost, my great, great-grandfather, was a Private in Co. H, 13th Kentucky Calvary from Dec. 1, 1863 to June 10, 1865. He named my great-grandfather, Ulysses Simpson Frost. His nickname was "Grant." Vada Frost Boles, her husband, Elmer Boles, George Boles' grandson, and my mother.